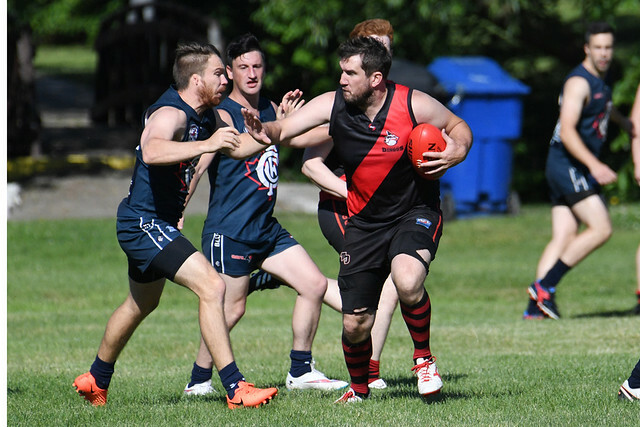 The Toronto Dingos kicked off AFL Ontario round 5 action with an early Saturday morning start against the Central Blues. 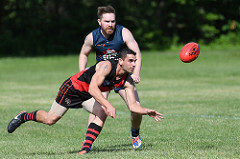 Both teams came into the match with a single win to their names, with the Blues having beaten the High Park Demons in round 4 and the Dingos having last won in round 2 against the Grand River Gargoyles. Still struggling with injuries from earlier rounds the Dingos called veteran full forward Paul Tinkler out of retirement as well as Andrei Burcescu. The Dingos were also able to give Canadian rookie Geoff Smith and Irish sensation Matt Rafter their first taste of AFL football. From the opening ball up it became clear that this one was going to be an arm wrestle with both teams getting their share of the football but neither able to capitalize early. The first quarter was a defensive battle with little scoring until towards the end of the quarter as the two teams exchanged goals, leaving the score tied at 1.0-6 going into the first break. The Dingos were able to secure more of the ball in the second through the strong play of ruckman Tom Bell and the unrelenting presence of Steven Speers who was everywhere. They were well assisted in the midfield by Daniel Gunn and Tim Indian. Up front Tinkler was able to show that he’s still got it taking several strong grabs while working his leads well with Rob McNaughton who recently returned to the lineup from injury. Eoghan Bergin was courageous in the half forward line throughout the game alongside Everett Wells and Rafter. At the defensive end captain Michael Bocian led by example with his typical hard nosed style of play, dishing out several crunching tackles and providing strong direction to his teammates. He was joined in the backline for the first time this year by coach Michael Karas returning from offseason surgery, who accounted well for himself in contested play and dished out a number of strong pressure relieving kicks. Stephen Donnelly and Patrick Bossey also worked hard in the half-back line to release pressure and direct play up the ground throughout. The Dingos were able to convert the pressure up front into four majors but given the tight nature of the game would come to rue some missed opportunities at both ends of the ground. Ultimately the Blues were able to respond in kind throughout the quarter with four majors of their own and the Dingos went into the halftime break with a slender four point lead (4.4-28 to 4.0-24) and the game hanging in the balance. In the third quarter the Dingos found themselves on the end of consistent pressure and with no bench to speak of started to struggle to win consistent contested ball despite the continued strong efforts of Bell, Speers, Gunn, and Indian around the ground. The Blues kicked a single major for the quarter while the Dingos were unable to respond with another of their own. As a result, at three quarter time, it was the Blues who this time found themselves with the narrow four point lead (5.5-35 to 4.7-31). In the fourth the Dingos lost Gunn to injury early, and with the tide already having started to turn, the Blues made the most of the man advantage putting on three goals to one in the final term to run out the victors 8.5-56 to 5.9-39. Ruckman Tom Bell was awarded the Paul Tinkler Pewter for best on ground, while Speers, Bossey, Donnelly, and Bocian were also named in the best for their consistent efforts throughout the match. The Dingos will get the chance to avenge themselves when they meet the Blues again in round 9. For now though the focus moves to their next hit out which is against the High Park Demons 3 PM Saturday July 8th at Humber College South.